Mr Karam Elahi Bandial son of Mr Fazal Elahi Bandial was born on May 1, 1961 at Khushab. He graduated in 1981 from Government College, Lahore. 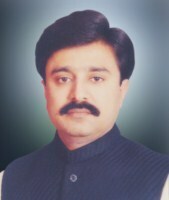 He remained Member, District Council Khushab during 1997-98; Nazim, Union Council Bandial (unopposed) in 2001; and Opposition Leader, Khushab District Assembly. He remained Member, Provincial Assembly of the Punjab during 2008-13 and functioned as Parliamentary Secretary for Cooperatives. An agriculturist, who has returned to the Punjab Assembly for the second consecutive term in general elections 2013 and is serving as Parliamentary Secretary for Energy w.e.f. 17 February 2017. He also functioned as Chairman, House Committee and as Chairman, Standing Committee on Information and Culture. Bandial, Tehsil Quaidabad, District Khushab.